The Shield Nickel with Rays - Design makes minting difficult! 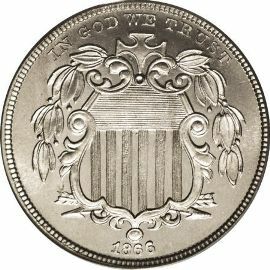 The Shield Nickel with Rays was minted between 1866 and 1867. It was discontinued after two years due to much difficulty with the minting process. The hard nickel alloy was very brittle and coining presses failed continually under the stress. The front of this coin closely mirrors the obverse of the Two Cent piece. It has a shield with a partial wreath covering the top. It also has the motto "IN GOD WE TRUST" on top and the date beneath the shield. oversized "5" surrounded by 13 6-pointed stars with rays in between each star. 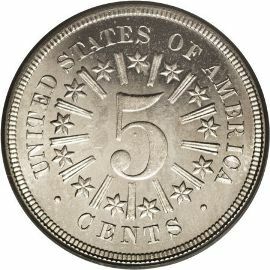 It also has "UNITED STATES OF AMERICA" along with "CENTS" encircling this design.